I was still thinking about it when I read JoAnn‘s post The Old Man and the Sea Revisited. Now I must confess that I had always thought as Ernest Hemingway as someone who was a great author, but not an author for me. But as I read I began to have doubts. Is this really the same book I read in high school? How did I totally ignore the beauty in the simplicity of Hemingway’s prose? Was I not touched by the boy’s devotion to the old man? Did I miss the old man’s respect for the fish, or have I simply forgotten? And what about the old man and his struggles to overcome physical limitations? Now I was born by the sea. I live by the sea. I work by the sea; in a harbour office where I deal with fishermen and boat owners every day. Maybe this was a book I should read. I consulted the list, and I found that Charlotte had read ‘The Old Man and The Sea’ for the Classics Club. I love her blog, I trust her judgement, and so I had to read her post. She had found the loveliest cover. And what she wrote convinced me that this was, in all probability, a book that might speak to me. If you’d asked me to read a hundred pages about fishing, I would have laughed. But Ernest Hemingway’s hundred pages about fishing are like nobody else’s. 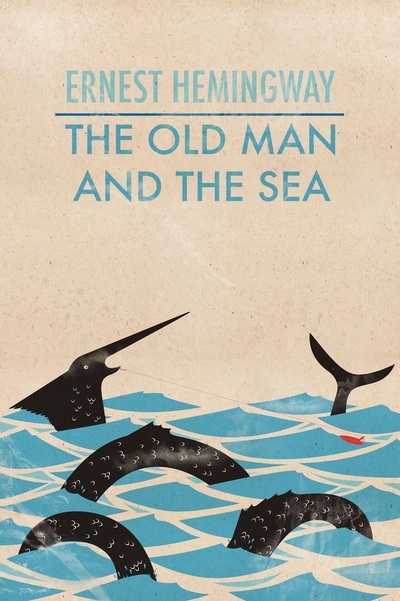 ‘The Old Man and the Sea’ is a literary work of genius where Hemingway shows himself to be a master of his craft. American literature and I don’t get on very well although I did add EH to my Classics Club list and when I saw JoAnn’s post also thought this might be the one to choose. I love the likes of Edith Wharton and Willa Cather, but I’ve read very few American men. There are other books calling louder, but I have to give this one a chance. I’d rather read a hundred pages of JoAnn’s blog than even one more page of Hemingway. If I want to read American literature that says something about the lives of Americans I’d much rather read Fitzgerald or Faulkner or Cather or Nathanael West or Wharton or Sherwood Anderson or John Cheever or Philip Roth. In fact I could probably name a hundred American writers I’d rather read than Hemingway. That bad?! I think I have to try – I’ll give most authors the benefit of the doubt once – but I’m not going to persist if I don’t like his style. Life is too short! I think I have always found Hemingway a bit of a poseur in both his life and his fiction. His portrait of Fitzgerald in A Moveable Feast was consciously cruel. But his skewering by Lillian Ross in the pages of the new Yorker sealed the deal for me. The only one of his books I round readable — but not re-readable — was The Sun Also Rises. I am perfectly willing to admit that my distaste for his personality may have given me a jaundiced view of his work. I read Joann’s post also and the quote was so beautiful she featured. I want to read it also! Yes, it was lovely. I’d never though of reading Hemingway until I read it. What a lovely post – thank you for the mention! I was very surprised at how different my experience with The Old Man and the Sea was this time around. I’d rather read most of the other authors AJ mentioned, too, but believe Hemingway deserves his place among notable American authors. It does sound like the thought of book that you might appreciate more with age – and I don’t think my teenage self would have like it either. I know very little about Hemingway – partly throughbeing British, and having been raised mainly on Victorian authors and partly because he’s never really interested me – and maybe that’s an advantage here. I can separate my feelings about the author and my feelings about their work sometimes but not always. I used to wonder if I was fair to the work if I disliked the writer … then, many years ago now I read Orwell on Dali and realized that better readers and writers than I had the same question. I adore Hemingway. I understand a lot of what peopel are saying in their comments. He’s not for everyone, and even some of his books are not for me (a reader who basically loves him). I loved A Farewell to Arms. I loved The Garden of Eden. I liked Old Man and the Sea. I really disliked The Sun Also Rises…. so, yeah, he’s complicated and he rubs some people the wrong way, sometimes. But he’s absolutely deserving of attention. His prose was unique and remains a landmark in literary tradition. He was a tortured soul, though. He did mock other writers (Fitzgerald in particular, who he thought was a bit of a “nancy boy.”) But, Hemingway struggled with his own sexuality, among other things, and ultimately committed suicide – he wasn’t perfect, but he’s interesting and talented and special, love him or hate him.